January « 2009 « R-V There Yet? Sunday started off to be a rather chilly day with an expected daytime high in the high 60’s (20° C). A group of about 35-40 residents of our park booked a “trip” across the border for the day. Tinka is almost invisible behind all the tall people waiting for our bus, courtesy of Viva Mexico. 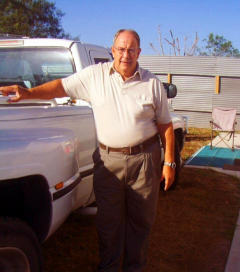 Our bus arrived at about 10 AM and off we went to Roma, TX where we crossed the border into the town of Miquel Aleman. This trip was obviously set up for those that had no Mexican experience what-so-ever. We were off to a hall where we met up with four other buses full of tourists. The hall was old and surrounded by your typical ethnic sites such as supermarkets, Auto Zone, Church’s Chicken, and Burger King. We were served a pretty good meal and all the beer, soda, and margaritas that we could consume. Things were looking up. We were also treated to the entertainment of a Mariachi Band that was actually pretty good. By the way, they got all the beer they could drink too. After lunch we were whisked off to the countryside to an arena where we were treated to demonstrations by cowboys, cowgirls, and cockfights. 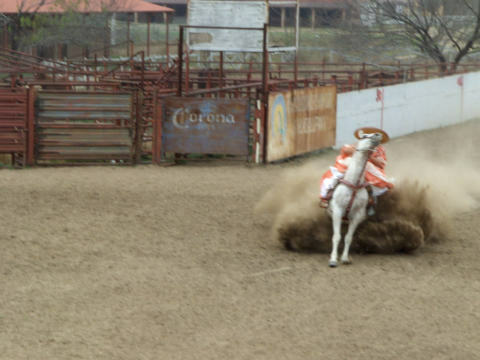 The cowgirls showed us their precision riding. And stopping on a dime, in a cloud of dust. 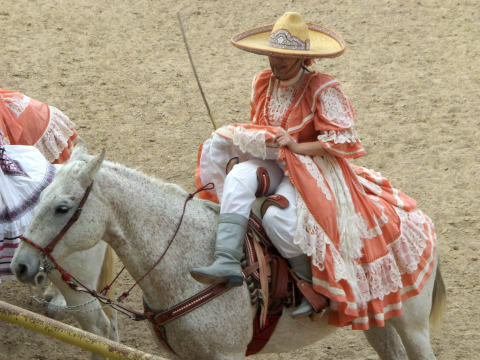 All of this riding is done side-saddle. I never could figure out why they didn’t come flying off of the horses. Finally the secret revealed. Leg supports under the skirt. 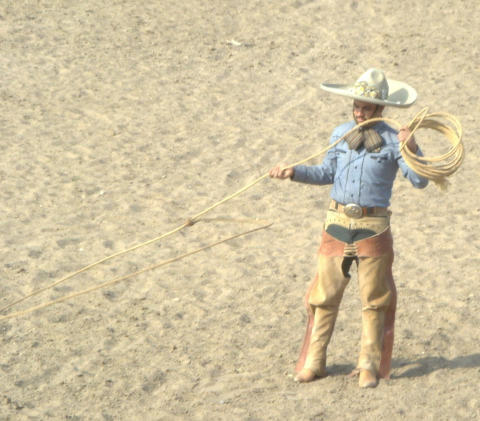 The cowboys showed us how they bring down a calf. They grab the tail and yank on it until the calf spins and trips to the ground. 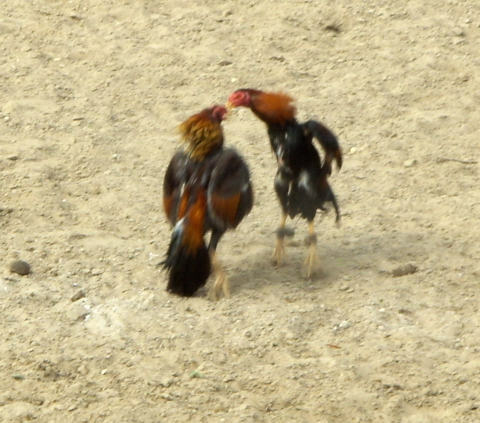 The cockfight demonstration had the birds with their talons covered and going after each other. A real cockfight would have knives attached to the bird’s legs. We were taken back to town and to the hall for more food, drink and the highlight of the day. 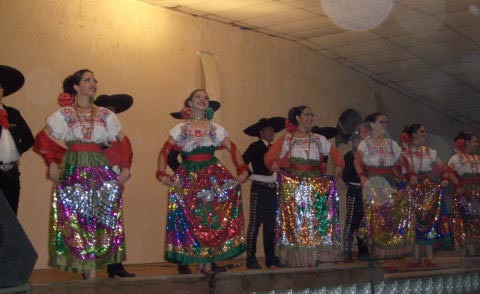 The Viva Mexico people outdid themselves and arranged for a performance by a professional Ballet Folklorico group from Reynosa, another border town located about 60 miles to the east. The lighting was bad, so the photos suffered. (Not to mention the spots on the lens.) There were 6 men and 6 women in the group. One skit consisted of the actors dressed as a bunch of really old men. I think they were silently making fun of the Winter Texans assembled in the hall. 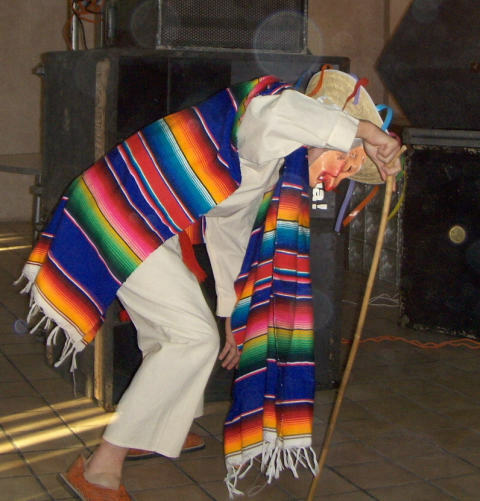 Each skit was set in a different time of history and the costumes varied accordingly. It appears that they spent a fortune on some of these outfits. 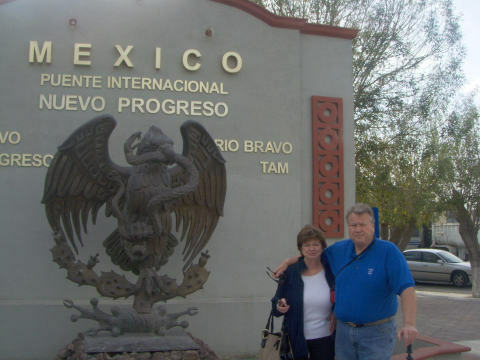 We left the hall at about 6:00 PM and headed back along Mexican HWY 2 and through Reynosa. We re-entered the US at Hidalgo, TX and made it back home by about 9:00 PM. We would have to say that this short little tour would be well worthwhile for newcomers to the Mexican experience. We enjoyed it, especially the ballet. 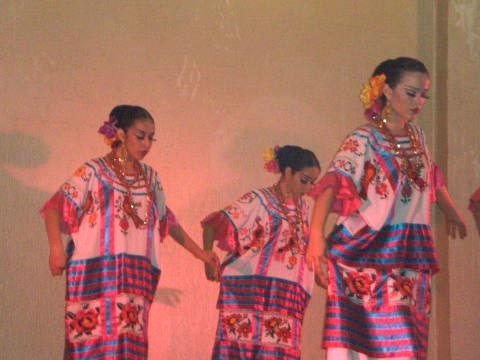 Viva Mexico runs several tours that go much deeper into the country and some that extend for several days. The buses are very modern and provide plenty of leg room. 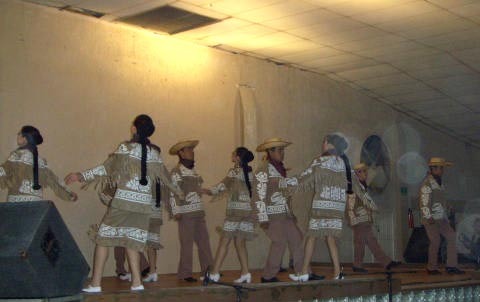 As a group, we would certainly recommend Viva Mexico as a company. 2008 was a great year and we wanted to thank the nearly 150,000 visitors to our blog.Our server logged visitors from 87 countries. This may not be all of them, but of those recorded, 87.4 % were from the United States followed by 4.55% from Mexico and 2.37% from Canada. You can click on the list to enlarge the chart. How did they find us in Botwana, Liechtenstein, or the Faroe Islands? Oh well, we’re glad they did. We’ve enjoyed sharing our travels with you and look forward to a great 2009. There seems to be no shortage of visitors heading to South Texas in search of beautiful weather. 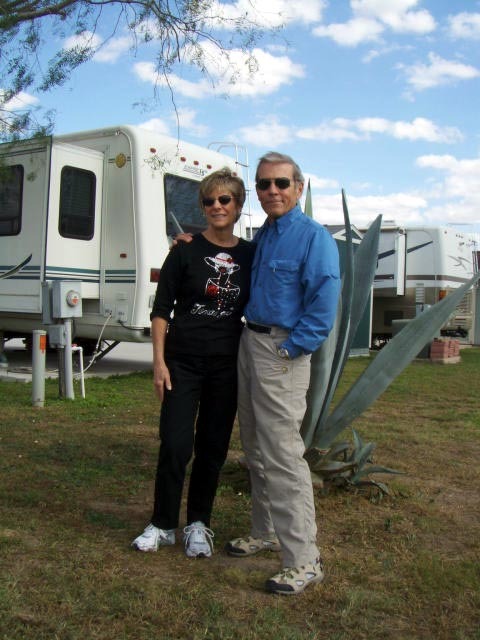 Unfortunately, our friends, Roland and Karen from Tucson, were greeted by the coolest week of the winter. Daytime highs stayed in the high 60’s and low 70’s. Here they are, dressed appropriately. The temperature wasn’t the whole story, the brisk northerly winds persisted at 15 to 25 MPH. Even the exercising required layers of clothing. Not all activities were dampened by the weather. We learned a new card game and played dominoes. 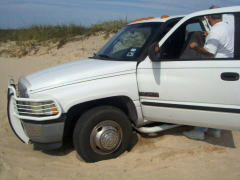 We also made a day trip to South Padre Island to take a look at the effects of Hurricane Dolly. It appears that the island fared quite well, however, roof repairs are still underway. Some of the businesses on the strip are remodeling and others are closed. Areas of the dunes were being reconstructed. You’d love the pictures, but our camera battery died. Beware of soft sand. I should have know from experience driving the truck on the beach in the past. This time I thought that I could turn onto the bay side and take a little bay tour. Wrong!!! Turning off the pavement, the 4000 lb. front axle sank immediately. The rear wheels didn’t even get off of the pavement. The photos below don’t look very bad, but the poor traction resulting from the light rear end of the dually kept us trapped. Thankfully a kind soul came by and gave us a little pull back onto the road. We were again grateful that we always carry a heavy tow chain. Next time we take the Jeep. We had lunch at Dirty Al’s, which is located on the bay side just before you enter the county park on the south end of the island. The plentiful helpings were quite good and reasonably priced. Unfortunately the Los Ebanos Ferry was still closed due to high water so we made another side trip to Nuevo Progreso, MX for lunch. Our second trip to Angel’s was as good as the first. They perhaps have the best salsa, with a side of jalepeños. 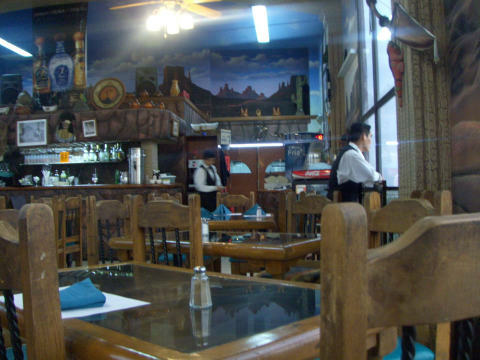 Tinka had the “Shrimp – Progreso Style” and it was wonderful. It was shrimp in a light wine/cheese sauce. I don’t understand how Progreso can have a shrimp “style”, since they are 70 miles from the water, but they pulled it off. A friend of ours from our park, Ruthi, is an entertainer that has found quite a niche and a large following in the Valley. This is only her second year in the area and is booked nearly every day. (25 in January alone.) 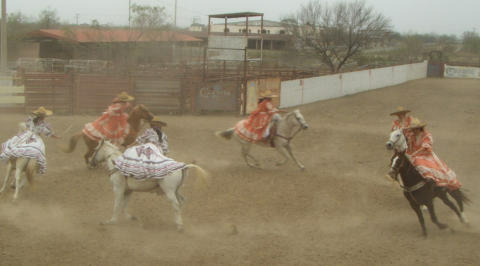 Entertainment in this Winter Texan Mecca is a little unique. 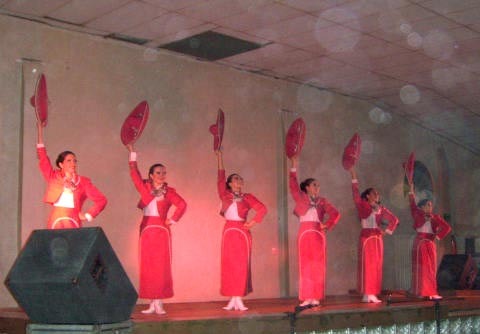 Many of the performances are from 2:00 – 4:00 PM or some as late as 4:00 – 7:00 PM. I guess this is so the old people can get to bed early or not drive after dark. Anyway, the four of us headed over to the Mustang Lounge to watch Ruthi perform. 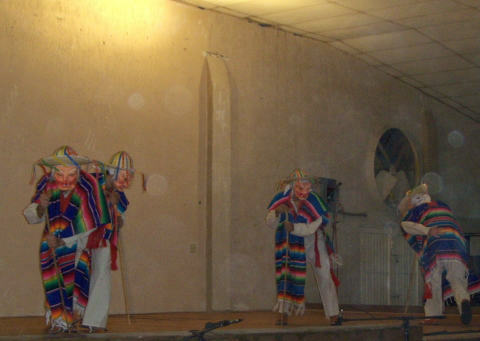 There were about 150 people there to see the performance and dance. The larger than expected crowd overwhelmed the wait staff. We ordered some food that took about an hour to arrive. After 1 1/2 hours, Tinka’s nachos never appeared. Apparently another waiter snagged it. With the order canceled, we left with a hungry and peeved Tinka who had consumed several adult beverages in anticipation of a meal. 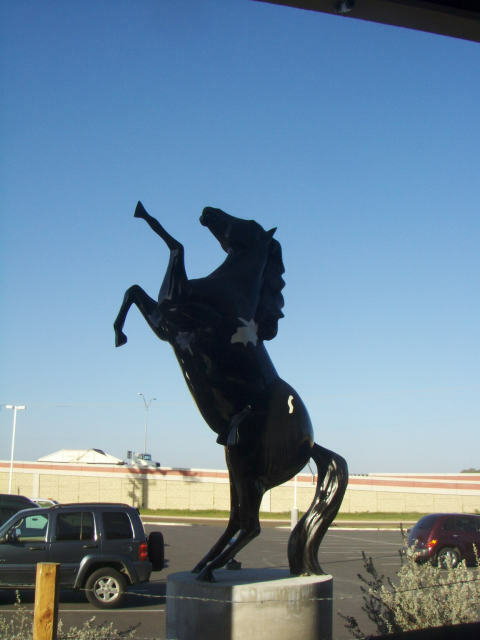 This mustang stands guard over the entrance to the Mustang Lounge. Well, once Roland and Karen departed, our weather returned to the mid-80’s. For the time they were here, the weather was better back at their home in Tucson, but we were glad to get the opportunity to visit with them. First Visitors of the Year. We spent our last evening in the Dallas area as guests of our friends, Jerry and Dana. 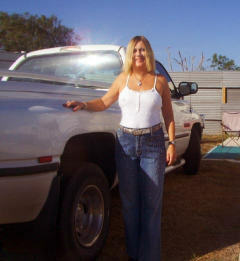 They returned the visit two days later when they arrived in their motor home to help us celebrate New Year’s Eve. They arrived on December 28th and departed on January 3rd.During their visit, we made two attempts, one successful, to cross the border into Mexico. Our first attempt took us to Nuevo Progreso for lunch. The sun was in the wrong spot but we snapped this shot of Jerry and Dana on the bridge at mid river. We’ll have to work on Jerry’s relaxation techniques. Maybe putting down the blackberry would be a good start. 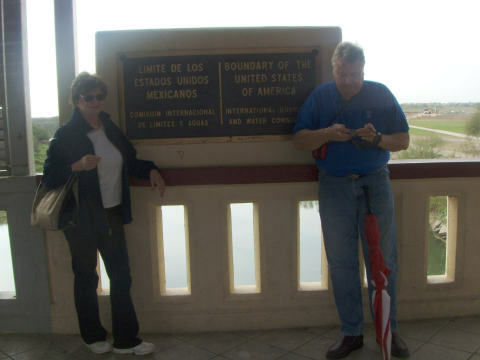 Once across the river they posed, again with the sun at their backs, in front of the Mexican border sign. We wandered around the main street and decided on a restaurant. 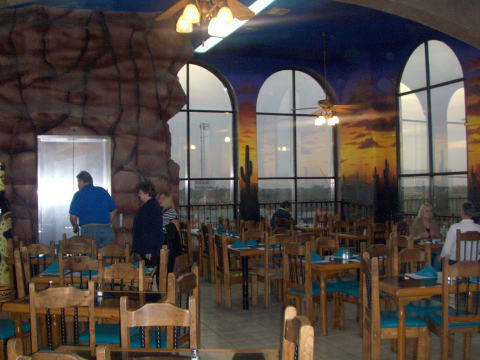 We chose the Arizona Restaurant that is located on the second floor above a liquor store. We arrived at an off-peak time. The food was good and the ambiance pleasant. Jerry, Dana and Tinka wait for the elevator to exit the restaurant. 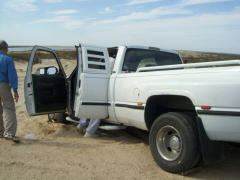 Our unsuccessful attempt to cross the border occurred a few days later about 20 miles west of McAllen. The crossing is known as Los Ebanos and is quite unique. 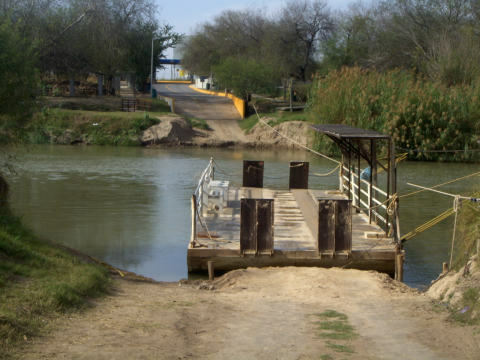 It is a hand-pulled ferry across the Rio Grande. The historical marker tells of its history. Apparently this is an ancient ford, first recorded usage was by Spanish explorers and colonists under Jose de Escandon in the 1740’s on the Rio Grande. A salt trail led from here to El Sal del Rey (40 mi. NE). The ford was used by Mexican War troops, 1846, by Texas Rangers chasing cattle rustlers, 1874, by smugglers in many eras, especially during the American prohibition years, 1920’s and 30’s. The ferry and inspection station were established in 1950. Named for the ebony trees here, this is known as the only government licensed, hand-pulled ferry on any boundary of the United States. Unfortunately, on this day, the river current was too swift for safe operation and was closed. This shot is looking across the river at Mexico. The ferry can accommodate three autos and several pedestrians. Several Winter Texans use this crossing for bike rides to a small Mexican town a couple of miles from the river where they will have lunch and return. One unexpected observation was that the road to the ferry was paved on the Mexican side, but not on the US side. New Year’s Eve went well with a great celebration and dance at the park. Another of our friends, Ruthie, put on a great performance that lasted a little over 4 hours. Well, except for the economy, 2008 was good to us. We even ended the year with both of us weighing 15% less than when the year started. We returned to the States from Mexico in late March and wandered around Arizona and New Mexico prior to heading back to Texas in late May. Our plans were to spend a lot of time on the Texas Coast and work our way up one side of the Mississippi River and down the other. Unfortunately, the flooding in the Midwest and the fuel prices had us rethinking our plans. The end result was that we spent the rest of the year exploring the Texas Coast and the Rio Grande Valley. 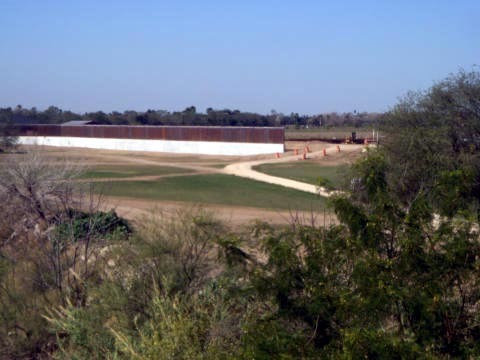 We spent the majority of the summer and fall in the Corpus Christi area and since December 1st we’ve been in South Texas near Weslaco and McAllen, Texas. At year’s end, our travel map showed the addition of several Mexican states. This represents the 675 days since the onset of retirement. 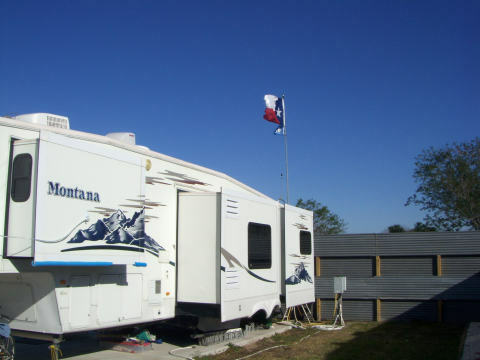 Our current plans for 2009 will be to move back to the Corpus Christi area sometime in mid-March. In June and July we hope to complete our earlier plans to tour the central US. 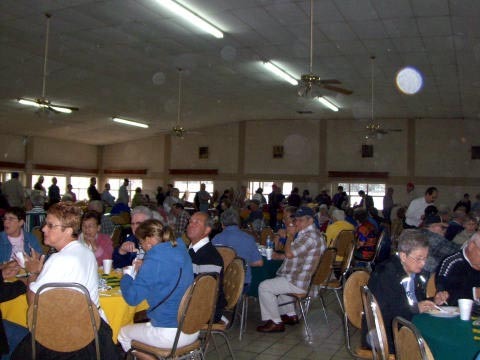 We will again work our way to South Texas for the remainder of the year with the exception of a period in October to attend Rick’s 45th high school reunion in Rockford, Illinois. Our intent is to, once again, spend some portion of next winter in Mexico. This time we will head from South Texas to the Pacific Coast rather than the long trek through Tucson. 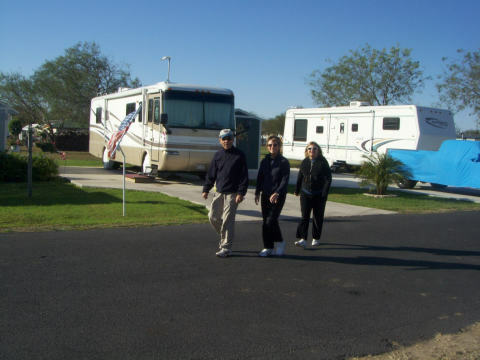 It is undecided whether we will haul the 5th wheel on this trip or just drive the Jeep and find a bungalow to rent. In any event, by the end of 2009 we hope our map will look like this. The YELLOW areas are the proposed new travel. You are currently browsing the R-V There Yet? blog archives for January, 2009.